This small saucepan is the ideal size for reducing sauces, melting butter, and preparing individual portions of a variety of foods. The pan is oven safe, making it useful to keep dishes warm or to finish them away from the stovetop. The straight sides are a more moderate height, better facilitating work with your ingredients. The lightest weight of all of Mauviel's cookware, the 1.2 to 2 mm thickness of copper in this line of pans makes manipulating them easier. And since the copper makes up 90 percent of the material of the pan, you don't sacrifice heat distribution or performance. The interior of the saucepan is lined with stainless steel, a durable and easy to clean cooking surface. The lid of the pan is well seated, the tight fit guaranteeing that moisture and flavor will cook into your food, not off. Varnished bronze handles are affixed with sturdy stainless steel rivets and the handle of the lid features a finial design. Hand washing is recommended to keep the pan in its best condition. The saucepan is backed with a limited lifetime warranty. 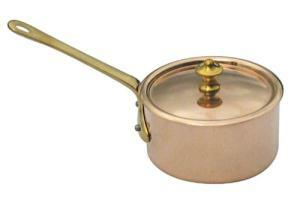 Mauviel is a name synonymous with quality in the world of copper cookware. With an attractive polished copper exterior, the pan will certainly capture attention. Here's another Mauviel saucepan to consider.